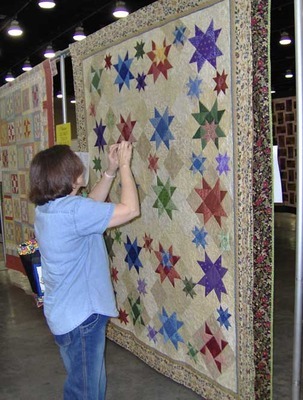 As promised I have some pics from the quilt show. There aren’t very many, because I tend to just photograph techniques or quilts, quilt blocks that I might like to try. First off, let me say that there was a traveling exhibit that is a must see if it ever comes your way. Actually it is 2 exhibits combined. Women of the Bible, and Men of the Bible. 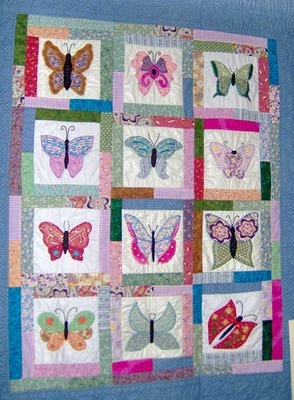 The small quilts in the Women’s part were pretty impressive and made by some truly talented women. 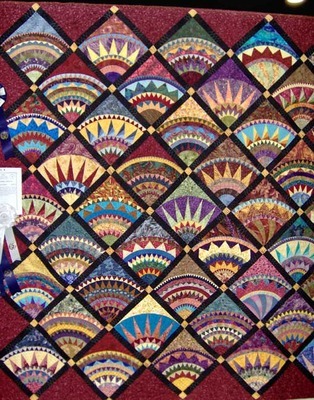 But the Men of the Bible quilts, all made by men, pretty much out shined the women’s quilts. 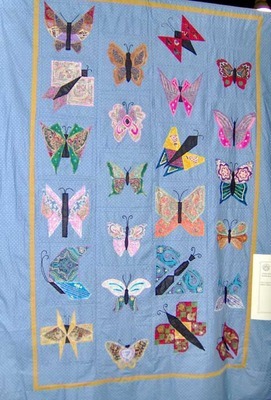 The first quilt picture is of a New York Beauty type quilt. In the future, I really want to make a quilt with blocks like these. Just not sure about all of those points, even with foundation piecing. 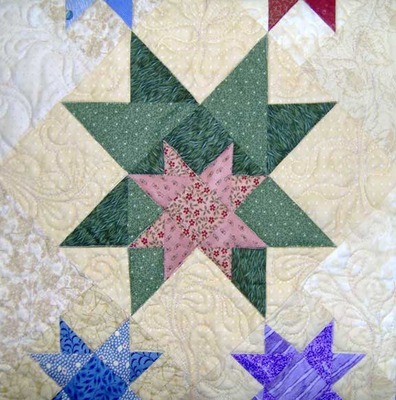 Then there was a star quilt that had stars within stars. I had never seen this type of block before. Carol Ann is trying to get a picture of a block. She’s not touching the quilt. That’s a no no at quilt shows. 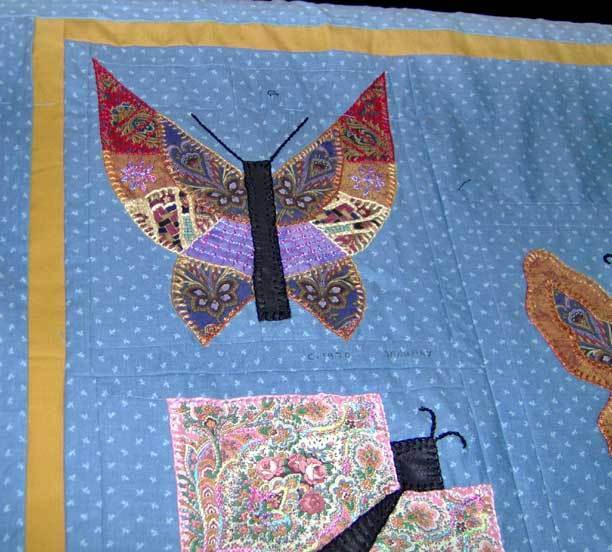 There were two other quilts, actually a quilt and a quilt top, that were different. They were butterflies made using printed fabrics and then embellished. This was the best quilt show I’ve been to in a long time. For several years it seemed like all the shows were the same, not much variety. This show was better, but all of the vendors seemed to be selling the same things. Guess you can’t have everything. 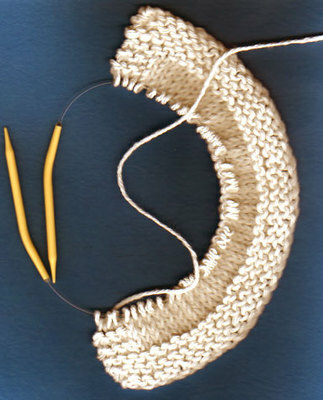 August 1, was the beginning of new KAL (knit-a-long) with the Six Sox Knitalong group. The pattern this time is a Gansey sock. It has cables and heart designs. I’m not big on hearts, so yesterday I reworked a thistle pattern to substitute instead. So when I get around to knitting these socks I will have thistles down the front and back of my socks. Our concrete driveway and sidewalk extension was poured on Tuesday. Looks good, next year we want to go ahead and run the sidewalk along the side of house to the back patio. That area doesn’t get much sun, so it stays bare and turns to mud when it rains. Kerry survived her steroid shot to the spine. When they brought her back to the room she was a little green around the gills. The nurse kept asking if she was going to pass out. Just a short while later she felt better and was released. Since she hadn’t been able to eat anything since the night before, we headed to IHOP and had breakfast. Talked to Kerry friday and she was feeling better. Could be several days before she feels any effects from the shot. I had taken my knitting to keep me occupied during all the waiting at the clinic. I had pulled out Eve’s sock and was knitting away, when Kerry’s nurse came in. The nurse asks me if I’m knitting socks and says that you never see anyone knitting socks anymore. Turns out she was from Scotland and she was telling how they had to knit in school. So we talked about knitting until she had to check another patient. Finished the leg on Eve’s first sock and now I’m starting the heel flap. 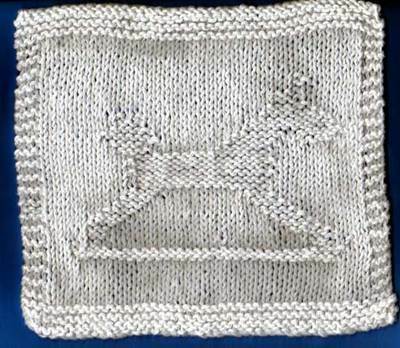 Finished the Monthly Dishcloth KAL – It’s a rocking horse. Sorry about the bad pic. I’m going to have to get Bill to show me how to get the pictures from camera to computer. The scanner just doesn’t cut it. Not much going on around here. I think I will venture out later today in search of corn husks and chili peppers. I’m in the mood for tamales. Yesterday I bought a 7½ lb pork shoulder. That should make a few tamales don’t you think? 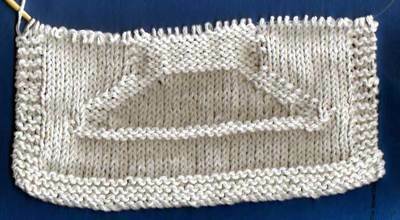 Here is the dishcloth after 3 days of the KAL. Does anyone want to guess what the pattern is? I unpacked a few more boxes yesterday and that didn’t even make a dent in how many are left. Still haven’t come across the jalapenos I canned over a year ago. They ought to really be Hot by now. The majority of the boxes are for the sewing room. When my sewing table is delivered and Bill puts up my shelves, then I can work on unpacking the rest. Just for fun here is a quiz. I already knew I was autumn. It’s always been my favorite season.